"Wind energy prices—particularly in the central United States, and supported by federal tax incentives—remain at all-time lows, with utilities and corporate buyers selecting wind as a low-cost option," said Berkeley Lab Senior Scientist Ryan Wiser of the Electricity Markets & Policy Group. Wind power capacity additions continued at a rapid pace in 2017. Nationwide, wind power capacity additions equaled 7,017 megawatts (MW) in 2017, with $11 billion invested in new plants. Wind power constituted 25 percent of all U.S. generation capacity additions in 2017. Wind energy contributed 6.3 percent of the nation's electricity supply, more than 10 percent of total electricity generation in 14 states, and more than 30 percent in four of those states (Iowa, Kansas, Oklahoma, and South Dakota). 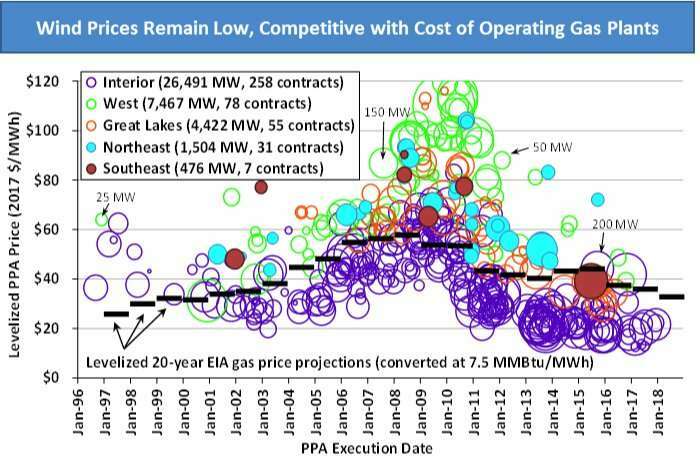 Wind energy prices remain low. 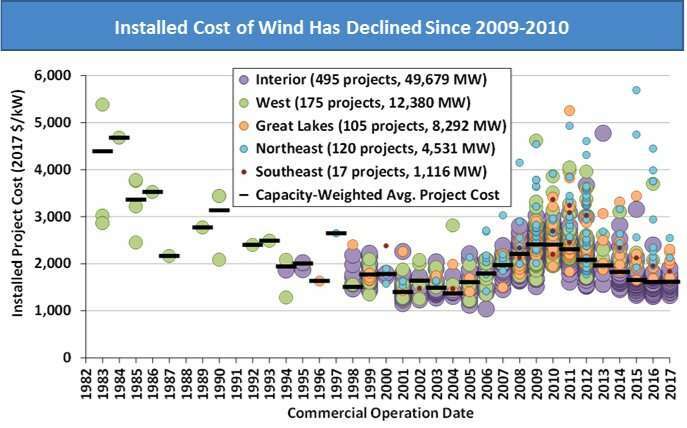 Lower installed project costs, along with improvements in capacity factors, are enabling aggressive wind power pricing. 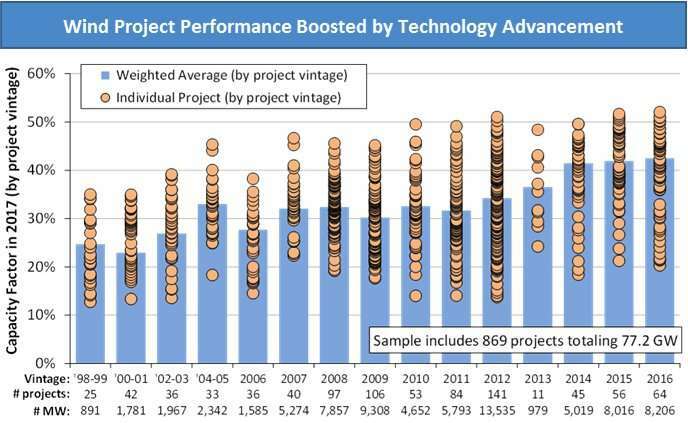 After topping out at 7 cents per kWh in 2009, the average levelized long-term price from wind power sales agreements has dropped to around 2 cents per kWh—though this nationwide average is dominated by projects that hail from the lowest-priced region, in the central United States. Recently signed wind energy contracts compare favorably to projections of the fuel costs of gas-fired generation. These low prices have spurred demand for wind energy from both traditional electric utilities and nonutility purchasers, such as corporations, universities, and municipalities. The domestic supply chain for wind equipment is diverse. Wind sector employment reached a new high of 105,500 full-time workers at the end of 2017. For wind projects recently installed in the United States, domestically manufactured content is highest for nacelle assembly (more than 90 percent), towers (70 to 90 percent), and blades and hubs (50 to 70 percent). It is much lower (less than 20 percent) for most components internal to the turbine. 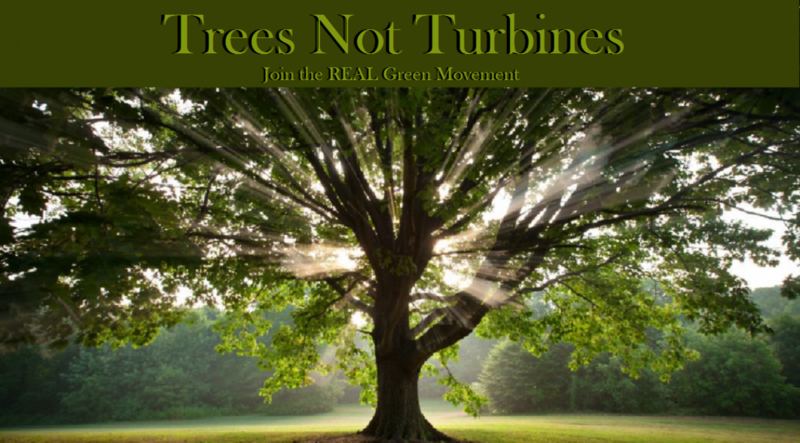 Although there have been a number of manufacturing plant closures over the last decade, each of the three largest turbine suppliers serving the U.S. market—Vestas, General Electric Co., and Siemens Gamesa—has one or more domestic manufacturing facilities in operation. "Batteries not included", neither coal/gas-fired backup plants nor integration costs. 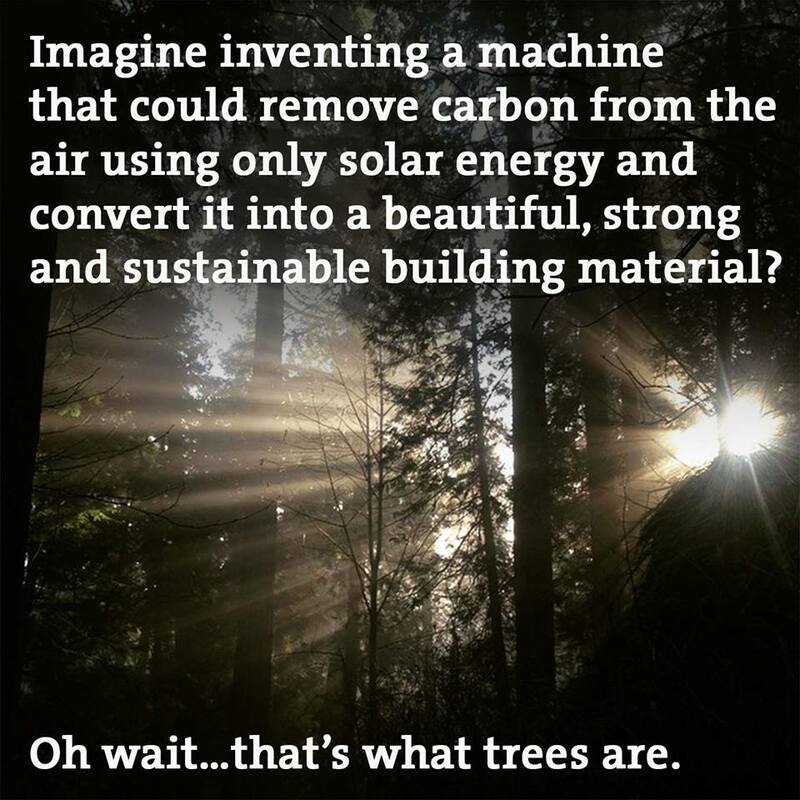 Intermittent renewables are attractive to provide "greenwashing" (decorative facade) to keep the expansion of the gas/fracking industry. 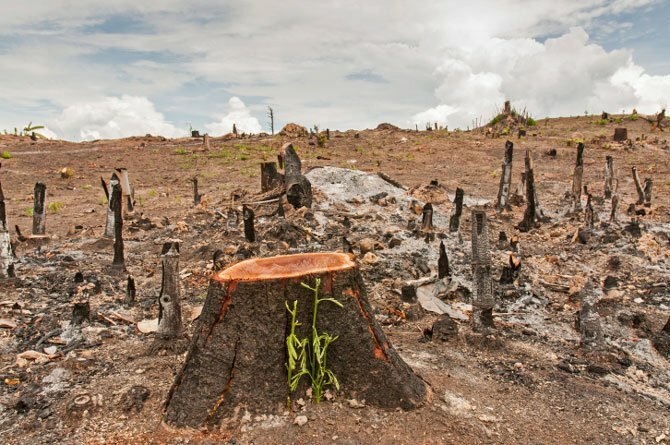 It's so Eco-friendly: chopping down trees to make room for bird-choppers/landscape-destroyers backed up by coal/oil/gas to compensate intermittencies. 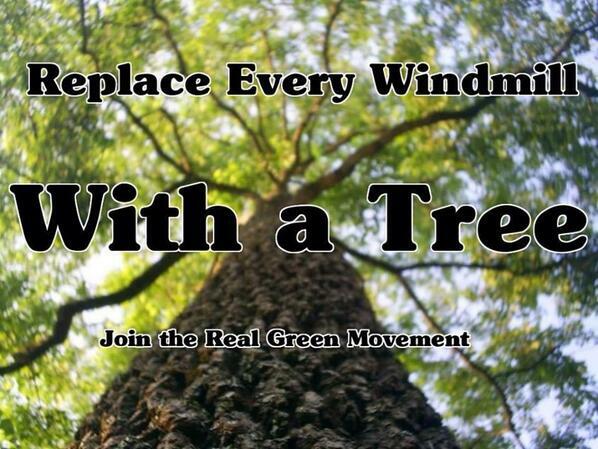 "Millions of trees chopped down to make way for Scottish wind farms"
"Replace Every Wind Turbine With a Tree" Protect birds and bats.